This item is not available for purchase online. Please call 214-912-8958 to order. Description: The top of the Featherweight lineup are the 222 Freearm Convertible machines from the late 1950's and early 1960's. Here's a 1955 in beautiful condition. Beautiful paint and decals. The motor has been replaced with a 110V US motor. The plug connector on the machine is still the original flat-pronged UK connector, and the wall plug has been changed to the standard US plug. really cool! The carrying case is the original Singer case with the side accessory tray. Included with the machine are the original Singer bobbin case, 5 bobbins, and a case key. 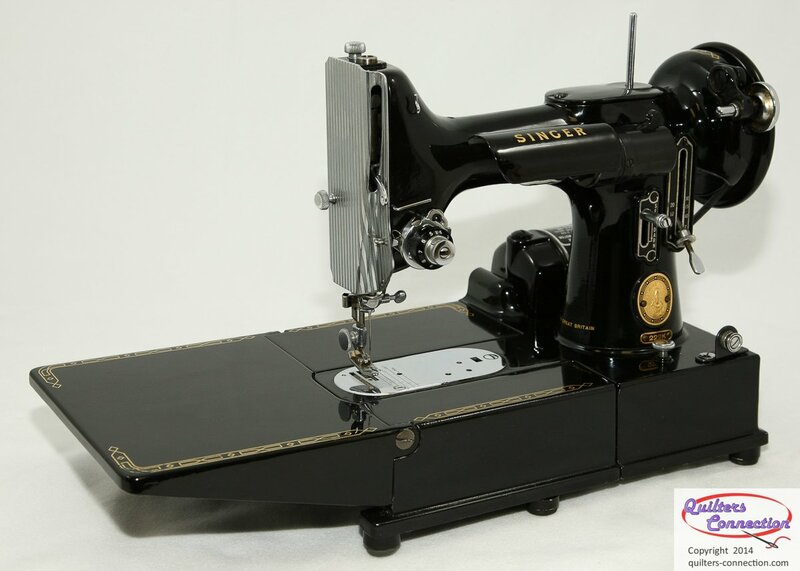 You will be the envy of your class or retreat with this Featherweight that has been serviced and is ready to sew. Price includes insured shipping to US lower 48 states only.